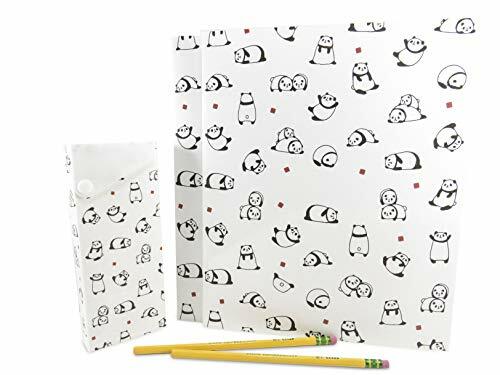 These cute two-pocket glossy panda folders with a pencil case and two pencils are perfect for your kids' back-to-school essentials. And with the fun panda design it makes them easy to find inside their backpacks or tote bags. This set makes doing school work and getting organized more fun and exciting for your kids! PANDA MANIA: Check out the cute panda as he dances, sleeps, ponders, and plays with a friend! The panda design is a fun attention-getter and may even help motivate your child to study. This set of 2 plastic panda folders with two pockets and 1 pencil case (11.5" x 9.25" - folder; and 3" x 7.5" - pencil case) by Daiso Japan with 2 cedar wood #2 yellow pencils (#13882) made by Dixon Ticonderoga. Pen, paper, and eraser are for demonstration purposes only and not included. LIGHTWEIGHT AND DURABLE: The plastic material of the folders and case make them very flexible, easy to clean, and long lasting. Open the snap on the case and a handy drawer slides out to store your pens, pencils, erasers, and more. BACK TO BASICS: These pencils are durable and just plain comfortable to hold. If you make a mistake, forget about the smudges with the latex-free erasers. GET ORGANIZED: Give these to your children for their back-to-school essentials kit, or give them as party favors at your child's birthday celebration.